The beauty of vinyl is that it’s maintenance free. Unlike wood, you will never need to paint or stain your vinyl fence which will save countless hours of time over the years. Having said that, once you invest in a vinyl fence you will want to take care of it to keep it looking fresh for years to come. Everything that is exposed to the weather and elements will start to look dirty and worn after a while if you don’t do some simple maintenance, and a vinyl fence is no exception. Here are 4 tips to help you care for and clean your vinyl fence. A simple spray of the garden hose is the best way to keep your vinyl fence looking fresh and new. The easiest and quickest way to care for your fence is to attach a spray nozzle to your garden hose and give your fence a quick bath every month or two. This will rinse off surface dirt and ensure it doesn’t get caked on over the years. If you’ve let it go a little too long and have some especially tough dirt spots after rinsing your fence, keep reading! A gentle cleanser with a soft cloth or soft brush can help with spots and stains the garden hose doesn’t get rid of. There may be some stubborn dirt spots that cling to your vinyl fence that need a little more elbow grease than a hose. In this case, a soft cloth with a mild bleach-based cleanser directly applied to the spot should easily remove it. 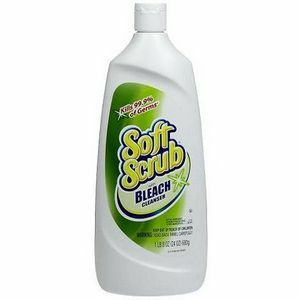 Some brands we have used and like are SoftScrub and Mr. Clean. Varsol works well for extremely tough scuff marks, and a soft brush can also help with tougher stains. Just ensure that you do not use a stiff brush as it could scratch your vinyl fence. Please note that if you have a tan vinyl fence, you will not want to use a solution with bleach and we recommend testing any cleaning agent on a small, inconspicuous area of your tan vinyl fence to ensure that it does cause damage or discoloration. 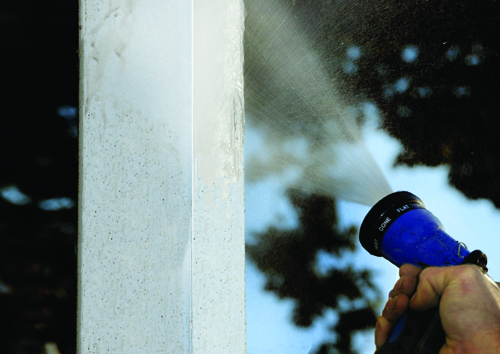 The Magic Eraser is a safe, easy, effective way to get rid of the tougher dirt stains on your vinyl fence. 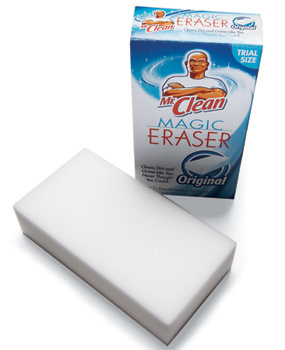 The Magic Eraser is a brand name cleaner that is like a sponge, and thus avoids the need for a cleanser and a cloth. Simply dampen the Magic Eraser and work away at your especially dirty spots. It works very well on eliminating the tougher stains and is safe for your fence. Please note that if you have a tan vinyl fence, you will not want to use a solution with bleach and we recommend testing any cleaning agent on a small, inconspicuous area of your tan vinyl fence to ensure that it does cause damage or discoloration. 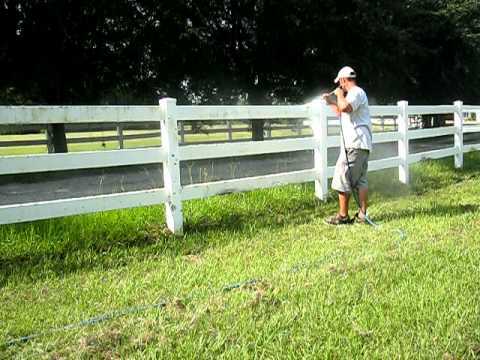 A pressure washer can be useful for cleaning a very dirty vinyl fence that has been neglected for some time. If you have neglected your vinyl for some time and it’s in serious need of a bath, consider a power washer. The pressure from the water will be more effective in removing tough stains and dirt spots than a simple garden hose sprayer. Wear some gloves and use this solution with a soft cloth or soft brush to remove the mildew spots. Please note that the chemical agents in this solution may be hazardous to the environment and your skin, so take care with both application and disposal. With some simple maintenance, your vinyl fence will look fresh and new for many, many years to come. If you have any additional questions, please contact one of our fence consultants at 877-77805733.